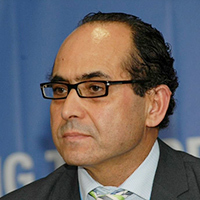 Hassan Qaqaya joined the United Nations Conference in Trade and Development (UNCTAD) in 1981 and was the head of the Competition and Consumer Policies Branch from 2006 to 2015. He specialises in competition and consumer policy, financial regulation, international trade and anti-dumping. In these areas, he has advised governments, public and private entities, and young competition and consumer agencies in more than 60 developing countries and economies in transition. In various capacities, he has been involved in teaching in this field and has contributed to 40 UN reports and studies. He established the UNCTAD Research Partnership Platform, which brings together research institutions, universities, competition authorities, business and civil society, and provides a platform for joint research and other activities with UNCTAD. Hassan holds a Master of Laws in International Law from the University of Lausanne and a MSc in economics from the London School of Economics. He has been travelling the world for the past 20 years, assisting numerous countries in drafting competition laws and application guidelines, and organising capacity-building workshops. He is a Senior Fellow in the Melbourne Law Masters and contributes to the MLM online Global Competition and Consumer Law program.